Matching Dragoons: Weird Western Tales #12 "Promise to a Princess"
Weird Western Tales #12 "Promise to a Princess"
John Albano, story - Tony DeZuniga, art - Joe Kubert, cover. Jonah is having breakfast when two gunmen walk into the saloon and threaten to shoot him. Jonah kills both of them without leaving his seat by shooting under the table. The townspeople, led by Mr. Craig, decide they have had enough of the dangerous Hex and plan on lynching him. Just then a horse comes into town with a dead rider that has an arrow in his back. Jonah leaves town during the confusion. Now the townspeople have to decide what to do about the Indian problem. The next day, while Jonah is bathing in a stream, Little Fawn, a Pawnee princess (who appears to be about 9 or 10), grabs Jonah's gun and kidnaps him. With the help of her wolf, Iron Jaws, she directs Jonah back to her tribes location. While they are crossing a bridge, the brigde breaks and Little Fawn accidentally shoots Jonah in the left shoulder. Jonah rescues her from the river and takes her back home. At the tribe's village, Jonah learns that Mr. Craig has delivered blankets treated with small pox to the tribe. Craig is just waiting for the tribe to die. While Jonah & the chief are talking, Little Fawn faints from small pox. Jonah decides to find a doctor & get some medicine. While leaving the village, Jonah kills at least two of Craigs men that are watching the village. It takes almost two days for Jonah to catch up with the doc, but he gets some medicine & goes back to the village. The entire village is dead but it's unclear if it is the work of the pox or Craig's men. Jonah finds Little Fawns body and then makes a vow over her grave that he will make Craig pay. Jonah rides back to town to discover that the town is infected with small pox and that Craig is dying. Jonah gives Craig the medicine and just as Craig is about to drink it, Jonah shoots the bottle in Craig's hand, thus dooming him to die from the pox. 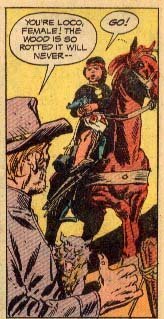 Jonah gets on his horse, General, and takes Iron Jaw the wolf & leaves town. Timeline: Since the Pawnee Indians were moved from Nebraska to the Indian Territory (Oklahoma) in 1874, this would be one of the earlier stories taking place between 1866 & 1874. A good issue with Jonah showing compassion for the helpless and those being treated unfairly.There were several large panels in the artwork with two splash pages. He was pretty ruthless by allowing Craig to think he was saved and then destroying the medicine in front of him. The terrain didn't resemble Nebraska, but some folks don't bother to research where various Indian tribes lived. 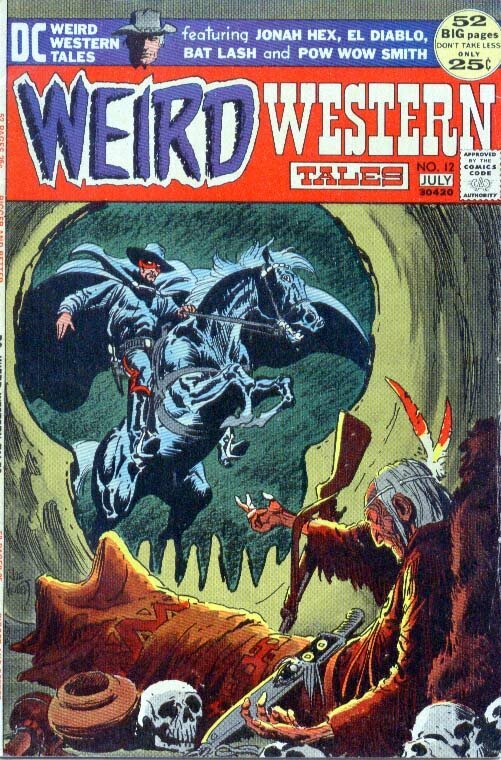 This issue also had an El Diablo story, a Bat Lash story, and a Pow-Wow Smith reprint. Next Issue: The Prodigal Son goes absolutely stark raving bananas.